March in the United States is Women’s History Month and it’s a chance to learn more about women’s history, from suffragettes to current issues, and to honor the women who have worked to help claim women’s rights and get us to where we are today. 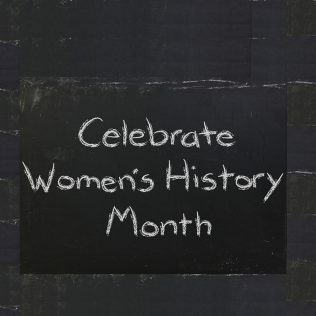 Beginning in 1981, Congress designated the first week of March as Women’s History Week, and then in 1987, proclaimed the entire month as Women’s History Month. Since then, the entire month has been taken to look back at Women’s History and forward at the continuing progress of women in our country. Many government institutions, including the National Endowment for the Humanities and the National Park Service, put on events or celebrate the progress in their own ways, many times through education. While there are some people that argue Women’s History Month isn’t a necessary time to set aside, it has provided a valuable platform for schools and communities to take time out to learn specifically about the struggles and achievements of American women. Many people have called 2018 The Year of the Woman, and it’s a concept that rings true for many reasons. For the past few years, women and their supporters have become increasingly involved in political movements like Me Too and Time’s Up. These movements have picked up where the original suffragettes left off and have worked to further women’s issues, forcing fellow citizens to take a closer look at concerns including wage gaps, sexual assault, and equality in all areas of life. Women are standing up for their rights in new ways and Women’s History Month allows us to take a look at just how far things have come, while serving as a reminder that we still have a long way to go. Around the country, many cities are hosting their own events to celebrate Women’s History Month, but if you live in Los Angeles, there are a few dedicated events that are worth attending. From networking to entrepreneurial meetings to alumni gatherings, you can find your own way to celebrate the history of women in LA. Whether you’d like to take a look at how women impacted your university, connect with other women who are starting businesses, or get more involved in your community, you can find great events happening around the city and you can purchase tickets via EventBrite. There are also official events, which actually kicked off in February with a proclamation from the mayor and an opening ceremony. Throughout the month, so far, there has been a women’s breakfast, living history tour, and various seminars. There are also opportunities to network with other women for help with marketing, photography, and other business needs. Whether you’re looking to learn more about the past or propel yourself into the future, there are plenty of ways to celebrate Women’s History Month around Los Angeles and the rest of the country. Take a look at events happening near you or host your own to start empowering women for the future. Whether you’re setting up for a Women’s History event or getting a group together to go to one, make sure to check out our selection of rentals.